Multiway Switching Four Light Bulbs Simultaneously Via Smartphone! If you remember the article I did on the single smart relay switch, there is now an expanded version of this board that is also based on the ESP​8266 WiFi module but packs even more extra cool features such as DC power connectivity, four relays with optoisolators, 3.3V regulator, USB​ to ​UART​ converter, NodeMCU header for connecting OLED displays, as well as an LED for GPIO LED test. The functionality of the single-way relay switch was already great for controlling light bulbs remotely via an​ android phone. 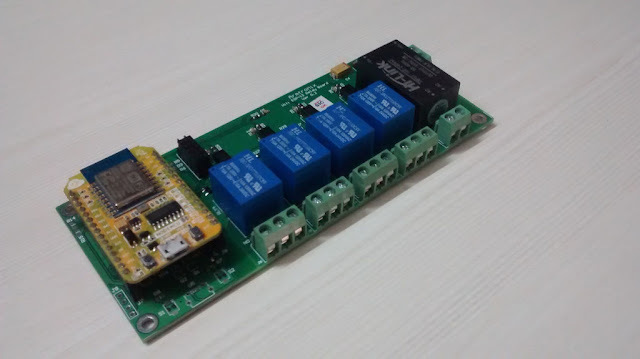 But now, with the four-way relay switch board you can connect even more sensors to the board and control four light bulbs at the same time. 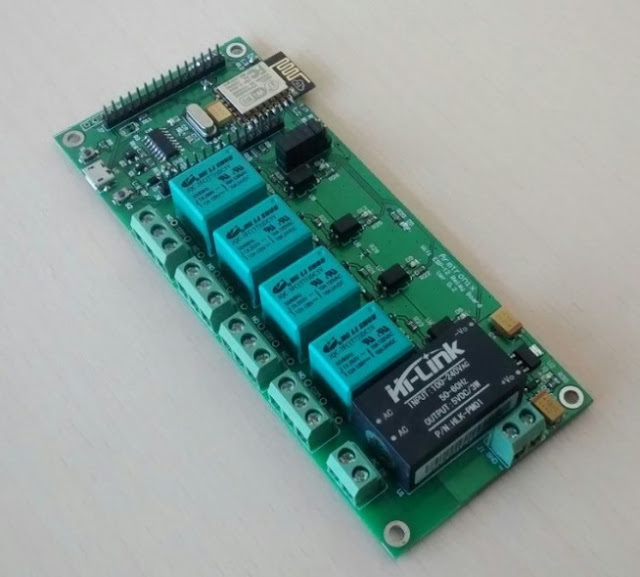 The four relay board also features a 100-230V​ ​/5V AC​/​​D​​​​C power supply to connect the board directly to mains electricity, two headers for connecting digital sensors, as well as a USB​ to ​UART​ converter onboard for programming the ​ESP​8266 to your liking. By the way, it's not just light-bulbs you can control. You'll also be able to create a WiFi smart power strip with four sockets and four two-way switches to control different appliances in parallel with each other, so you can turn on one appliance without having to turn on the others.